Awesome Pittsburgh is only possible because of the grant winners, trustees, volunteers, and other patrons of awesome who keep this thing going month after month. In our Awesome Asides, we find out what really makes awesome Pittsburghers tick. Our second profile features Tina Tuminella, our Awesome Ambassador and queen of PR. 1) Who are you? What do you do for a living? I am a part time stay-at-home mom who likes to write. I do volunteer PR writing for Awesome Pittsburgh and I work part-time in the Communications Department at Duquesne University. My friends would identify me as someone who loves to eat, cook, converse, write and send letters via snail mail, sing, read, and explore new places (I’m not a homebody). 2) Do you have any Sunday morning rituals? 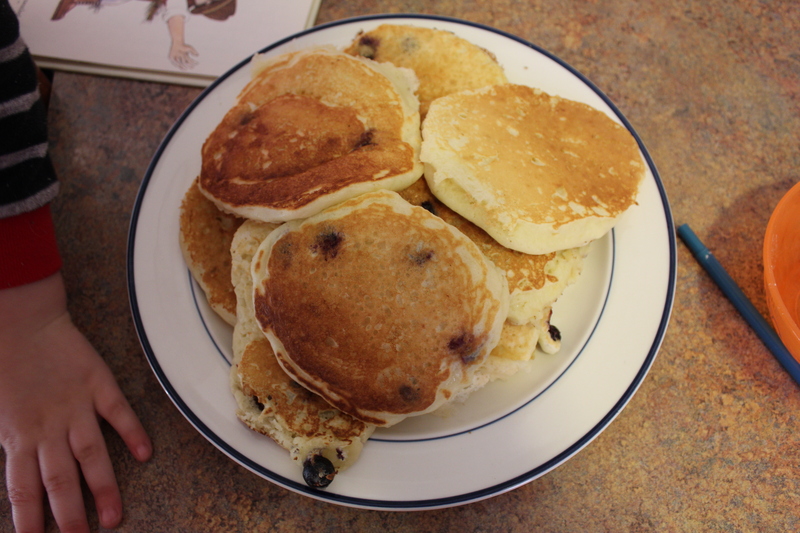 Lately, our Sundays involve blueberry buttermilk pancakes and bacon. I also watch Charles Osgood on “CBS News Sunday Morning” with my husband. No toddler TV on Sundays. Woo hoo. 3) What food or meal could you eat 7 days a week? 4) What’s the last book you read/piece of music you listened to? Book: Usually I stick to fiction, but I just started “Five Days at Memorial” which is about a New Orleans hospital ravaged by Hurricane Katrina. It won a Pulitzer Prize, so I want to know what all the buzz is about. 5) Favorite time of year and why? Autumn. I don’t like to be hot, so I love the crisp air of a fall day. I love the sound of walking through crunchy leaves. I also like turtlenecks and boots. And since I always loved school, autumn reminds of all my past beginnings of school years/semesters where classes were new and exciting. 6) Why are you glad you are a part of Awesome Pittsburgh? 7) Can you name a project (whether it be an applicant or grant winner) that you found to be most awesome? I was really impressed and inspired by “Bespoke Poetry” that won in June 2013. Artist Alexi Morrissey’s project allowed regular, ol’ people to become instant art patrons after walking into a downtown gallery. Patrons basically commissioned a poem after sitting with the poet in a private, one-on-one session; the poem was based on whatever thoughts/concepts/images were on that person’s mind that particular day. I appreciated the spontaneous aspect of this idea, and I believe we would all benefit with more poetry in our lives. 8) In reading about other cities’ awesome ideas, what types of ideas would you like to see happen in Pittsburgh? I would like to see more street art happening here. I think inhabitants of places like London and San Francisco are so used to being surrounded by public art, they just walk by and take for granted that this sort of thing is done. But in Pittsburgh, street art is not a daily occurrence. I read about a project funded by Awesome Boston called “Chasing the Shadows,” which was based on the simple premise of chalking the shadows cast on the sidewalks of people, parking meters, signs, fire hydrants, telephone poles, and bicycles. The artist talked about how even the most reticent people would become excited about the idea when she got them to pose in the middle of Mass Ave. Street art breaks the monotony of the day, encourages interaction between strangers, and brings a smile to most people’s faces. It also forces people to think about the role of an artist in everyday life.